Healthy Paws Pet Insurance & Foundation covers your cat from nose to tail. 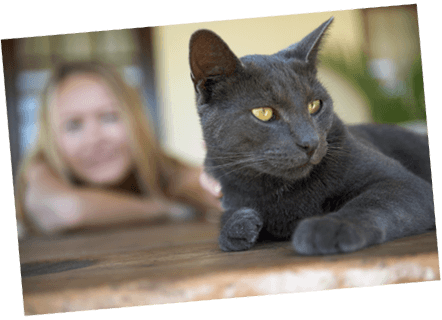 Our cat insurance plan pays on your actual veterinary bill and covers new accidents and illnesses, emergencies, genetic conditions and much more. If your cat or kitten needs treatment for a new accident or illness (except pre-existing conditions), you're covered. It's that simple! Healthy Paws Pet Insurance coverage has no caps on payouts. If your pet needs treatment for an accident or illness, and it’s not a pre-existing condition, you’re covered. It’s that simple. Save up to 90% on vet bills, with no caps on per-incident, annual, or lifetime payouts. A pre-existing condition means that the condition first occurred or showed clinical signs or symptoms (there doesn't need to be a diagnosis) before your cat's coverage started, including waiting periods. Healthy Paws excludes pre-existing conditions from coverage as do all pet insurance companies. We are all about protecting your cat from the unexpected and you from the financial problems their treatment may cause. Our cat insurance plan doesn't cover pre-existing conditions, the examination fee, or preventative care, such as annual check-ups, vaccinations, spay/neuter procedures and teeth cleaning. For more information, see our complete list of exclusions. Bella is fearless. This brave kitty defied the odds and beat cancer with the help of advanced treatments costing $8,600. Thankfully, Bella’s parents had Healthy Paws Pet Insurance—which has no limits on claims—and were reimbursed for over 80% of Bella’s treatment. Did you know Healthy Paws covers emergency care at no extra cost? Get a free quote. "I love Healthy Paws! I have two cats. One has a heart condition and I rest easily knowing that his tests and medications are covered." When your cat gets a little too curious and needs emergency care or develops a diabetes later in life that takes you both by surprise, Healthy Paws can help you give your kitty companion the best medical care. Kittens and younger cats can get sick just as easily as older cats, experiencing illnesses like urinary tract and upper respiratory infections. Kittens are also incredibly curious and have a tendency to eat things they shouldn't, like sewing needles and rubber bands. As your cats gets older, they may be affected by a hereditary or congenital condition that could cost you a fortune if you don't have pet insurance. With Healthy Paws you'll be protected for the lifetime of their policy. Just enroll your "purry" friend up until their 14th birthday. Join today and our Healthy Paws Pet Insurance team will be there to protect you and your cat from life's (mis)adventures. With Healthy Paws, you can visit any licensed veterinarian including the specialists and emergency animal hospitals that can truly make a difference in your pet's care. We even cover alternative care. After enrolling your cat, you will have a short 15-day waiting period for new accidents and illnesses and a 12-month waiting period for hip dysplasia1. Claims. Fast, Easy, Worry Free! With no more claim forms, we've created the fastest and easiest claim process for our customers. 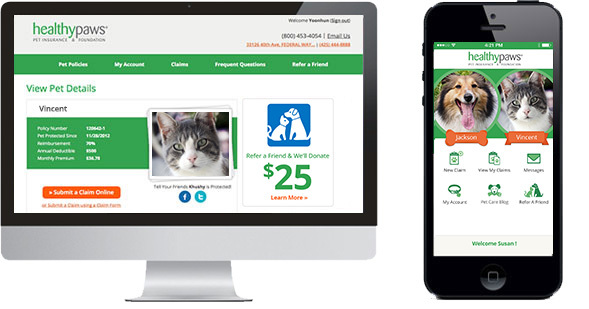 Just take a photo of your vet bill and submit it through the Healthy Paws Mobile app or through our online Customer Center. It’s that easy! We'll process your claims quickly (in fact, 99% of our claims are processed in just 2 business days) and send you a reimbursement check via mail or you can sign up for direct deposit. Of course, if it's your first claim, we'll need your pet's medical records to complete your claim. We may also pre-authorize very expensive treatments (on a case-by-case basis) with your veterinarian hospital to help reduce your upfront burden. The Healthy Paws pet insurance plan is easy to understand, we reimburse quickly, and you can count on us to help, especially when it comes to reducing the stress of caring for a sick cat. 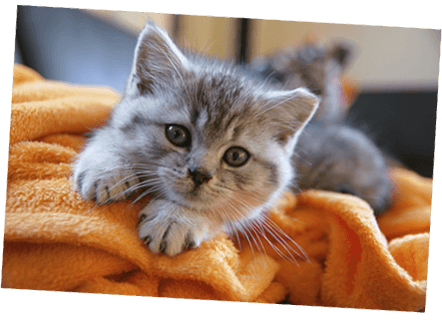 Our commitment is to provide you and your cat with the best customer service and best pet insurance plan in the country. We are grateful to our pet-passionate customers for sharing their love of our plan and service by giving us a 98% satisfaction rating at Consumer's Advocate! "It was wonderful to be able to focus on getting my fur-baby better instead of figuring out how I could afford it! I am so thankful that they were supportive and made the process so easy!" *This is an approximate reimbursement based on covered treatments using a 90% reimbursement level and a $250 annual deductible. 1Lifetime hip dysplasia coverage provided at no extra cost when you enroll before the age of 6 (otherwise excluded from coverage).